Three frosty miles at twilight. Winter running can be beautiful! Monday: 3 miles at a 9:39 average pace. Despite the pace of my run on Monday not being anywhere close to what I want– or feel I should be at– I still had a great run after work on Monday. The weather was in the teens and the wind in my face stung bitterly. I had on three layers– a short-sleeve shirt over a long sleeve shirt with a jacket, all moisture-wicking of course, so I was warm enough, but all I could think about was, “Please God, don’t let my face freeze this way!” I ran a new course near my home and found a path to a new trail– score! But the sidewalks were still icy in some places and I twisted my left ankle twice going over some rough terrain. Thanks to Timex for sponsoring my run in solidarity for a healthier America! I was still able to finish the run just fine, but those little incidents are always terrifying and it definitely reinforced the fact that the treadmill is an option– not a solution– when running outside is not possible. Mechanically-speaking, the body needs to be trained to handle uneven terrain that a treadmill couldn’t possibly offer, and I was just rusty enough to be concerned about two ankle twists in one run. Regardless, I made it a point to not look at my Garmin and check for pace and decided to just run how I felt, and I felt happy. Finally. In addition, I ran 3.23 miles in solidarity with the Partnership for a Healthier America through my Charity Miles iPhone app. Win! Tuesday: 5 miles at an average 9:29 pace. I almost didn’t go for a run– my ankle strain was a little more pronounced today. It didn’t hurt, but I was nervous about pushing it and risking injury on the still-slick trails. Tuesday was a balmy 15 degrees in Nebraska with wind chills at a straight zero degrees. Oh, and winds were sustained at 20 mph. I bundled up in a long-sleeve and a short-sleeve shirt and a running jacket, gloves, fleece-lined winter running tights, and a headband. I knew I would be warm enough to run and, after the first mile, I was honestly just fine. As I was standing outside my office waiting for my Garmin to pick up a signal, one of my departing co-workers said, “Good for you!” That was a nice break from the usual “you’re crazy” comment because I knew I was crazy, but I had to get my run done. No questions asked. No more treadmill. Grin and bear it. And, to be honest, the run was amazing. I ran into the wind for about the first mile and all I could think about was the cold. I didn’t think about my breathing, my dead legs, whether I’d be able to survive another hour in this— I just put my head into the wind and ran. While running under an overpass, I glanced at my Garmin and I was flying at a surprisingly easy 8:35 split! FINALLY!! It was just the lilt I needed to get through that bitter run. Miles 2-3 were just as great. 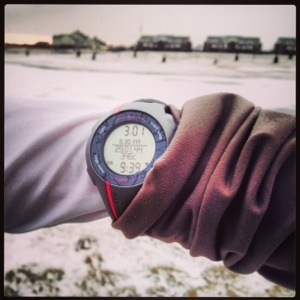 I slowed my pace a little, listened to the music, tried to be cautious of the ice and snow on the ground— I was present. It was awesome. But then I had to turn around just after mile 3 because I was approaching an area where I’d have to go under a very busy road alongside a creek that only exists because of a drainage system and the city closed that underpass down because that drainage system can literally drip nonstop and form a miniature glacier with ice a foot thick. I know because I’ve run on top of it before. 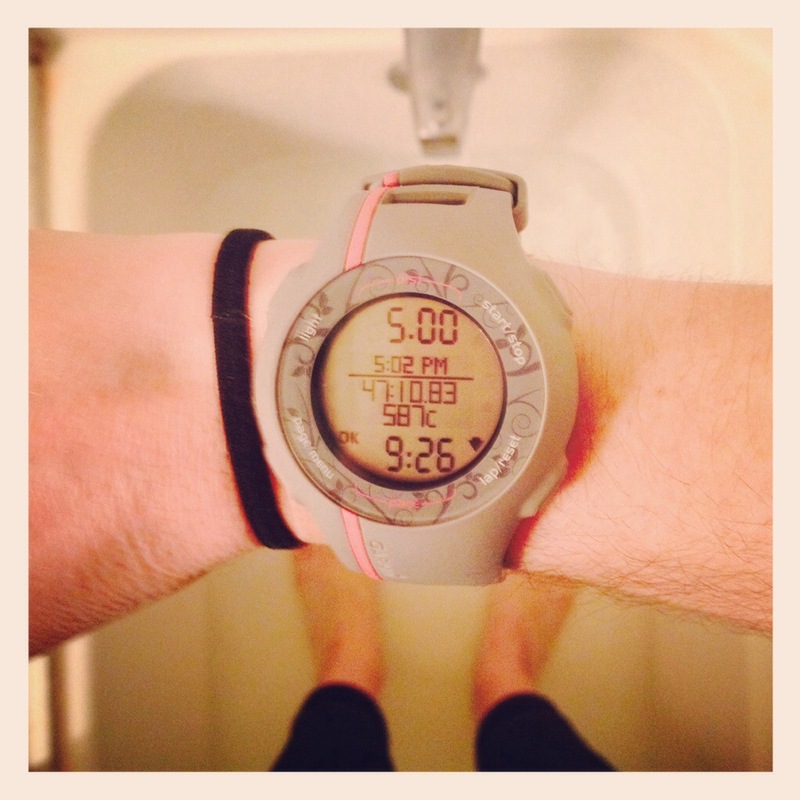 Standing in a hot bath after a very frigid 5-mile run. Took me at least an hour to warm up. I decided to turn around instead of cross the busy intersection and that’s when the wind literally attacked me. I can’t even describe what it’s like to have 20 mph winds with not a degree to spare hitting you in the face as you run into it at 6.5 miles per hour. It HURTS like HELL. I could feel the cold permeating my face and freezing the inner layers of my skin….or at least that was all I could think about. My form was all over the place as I just tried to keep my face down and run, but the cold was so painful I would cover my face with my gloves just for a scrap of warmth. That made me run erratically. My nose was running like crazy, my eyes were blurring up, and I could feel my skin getting chapped underneath my 3 layers. You might be wondering why I don’t have a face mask for bitterly cold days like this, but I haven’t been able to find one that doesn’t fog up my glasses, make me feel like I am suffocating, or cost a fortune. So, if you know a good one, please let me know. At any rate, I cut my planned 7-miler short to 5 miles, got inside as fast as I could, and was instantly nauseous with a face that resembled an over-100 fever. I’m insanely proud of myself for getting out there at all. That was not easy and the cold actually made me faster. I’m happy with that. Wednesday: Rest. After a truly successful run on Tuesday, I just wanted to get back out there and run on Wednesday. Unfortunately, my strained ankle muscle had other ideas. What I was feeling was not pain– it was just a very pronounced, tender feeling that went all the midway up my calf. I decided to take a rest day because I’m truly paranoid about major setbacks (especially when I have a high-deductible health plan!) so I hung out at home with my leg elevated and a frozen bag of blueberries on my ankle (frozen peas work better, FYI). 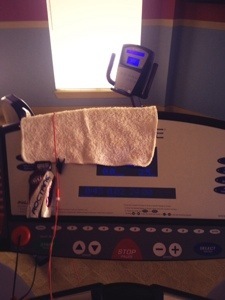 Thursday: 3 miles at a 10:00 pace; 20 minutes of spinning. Thursday presents exactly the reason why I need to become a morning runner. Early day at work full of back-to-back meetings that drained and overwhelmed me. I took a quick lunchtime walk and found that the air was freezing again. I know it’s winter, I know I am “from” here, but I don’t ever remember a winter being this cold this long. And it’s going to be colder this weekend when I have a 7-miler and a 12-miler. I’ve had it. But instead of staring it down and saying, “I’m stronger than the elements,” I trapped myself into a bad habit of overthinking. My calf was still tender, it was bitterly cold out, I had to run 7 miles. Treadmill? No, I said I wouldn’t. Trail? I’m tired of the extra challenge of bitter cold. Treadmill. Tempo run? Nah, I’m overwhelmed…just get the mileage. But once I got on the treadmill, it was all too much. The gym was hectic, my sweat towel fell off twice, I dropped my iPhone, got three text messages. The idea of running four more miles when my mind was all over the place was exhausting. I was over it. The thing is, I know I cut corners with running, I know I talk myself out of it when I don’t think I can rise to the standards I impose on myself, I know I need to stop doing that or my training will suffer. But I only do that when I put running off to the end of my day. Marathon training is hard when you’re an amateur. Life gets in the way and you have to choose to get out there and run. I need to do better for myself and, if I can’t get up in the morning to run, I need to stop overthinking and just go. The only thing that should matter is what I need to accomplish that day, not how I accomplish it. Running, unlike the million projects I have at work or the unexpected issues that life brings, does not require any other strategy except to just do it (thank you, Nike, thank you). This has to be my mindset going forward. Friday: Rest. Friday was just an impossible day to squeeze in a run. I had to wake up at 4:30AM to get to a meeting at 6:30AM that was an hour away. My gym doesn’t open until 5AM, and with the roads still being icy and I’m still not familiar with routes around my apartment, it would have been a terrible idea to attempt 3 miles. After my meeting ended at 12, I had to drive an hour back to the office but not before grabbing a quick fast food lunch (the sign that I was really in a pinch) before another meeting at 1:00 and then another at 3:00. I worked until 4:30 and had to rush home and change to get back to Omaha for a charity event that my sister was participating in that night; on top of which, it had started snowing. I didn’t get home until almost midnight. Friday was literally an impossible day for a run. They happen. But this is why I hate rearranging my rest days arbitrarily. Something always comes up. It’s not about life getting in the way; it’s about adapting when it does. Saturday: 7 miles on a .5% incline at an average 9:34 pace; 5 minutes of 90-pound leg presses, 40 bicep curls, 40 shoulder raises, 40 lats, 5 minutes of ab work, 40 donkey kicks. Saturday was a bitterly, bitterly, bitterly frigid day. Temps plummeted below zero with wind chills down to almost 20 below zero. Snow was falling, although not heavily. Just walking to my car from my apartment and then my car to the gym hurt my unexposed face with the icy wind that pushed me around as I tried to walk. Running in that kind of weather would be classified as an expedition, and frankly, I’m over it. I don’t care about rising to unnecessary levels of badass-ery in running. I’m not about to freeze to death just for the sake of an all-out, knock-down run in dangerous wind chills. That’s why God created people who created treadmills. And I know I swore off treadmills for the rest of training season, but winter was not going to let me have my way. Instead, I beast-moded it at the gym. I ran through the most droll college basketball game ever, listening to every range of music in my iPhone, counted the hundredths of a mile down until I got to the next mile and the next mile. I did ab crunches to Disney music, I closed the gym down. I know I’m stronger than the elements– but why pick a fight when I could do leg presses and donkey kicks? Sunday: 12 miles on a .5% incline at an average pace of 10:00; 20 minutes of hills on the spin bike at Level 6. All day Sunday, I kept putting off my long run. I usually do this when I am facing a long run. Long runs scare me because I have to overcome boredom, inadequacy, loneliness, and fear of failing. Plus, running in place for 2 hours when freedom is LITERALLY one step off the treadmill is the biggest mental exercise any runner can face. 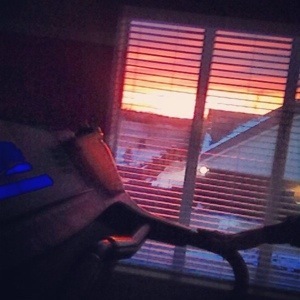 Spectacular sunset as seen from my treadmill. But, around 4:00, I wandered to the gym with a pack of Gu (I never use Gu on a treadmill) and slowly started my leisurely pace of 10:00. The miles ticked away at a blur. I spent my time watching “Caught on Camera” on MSNBC. 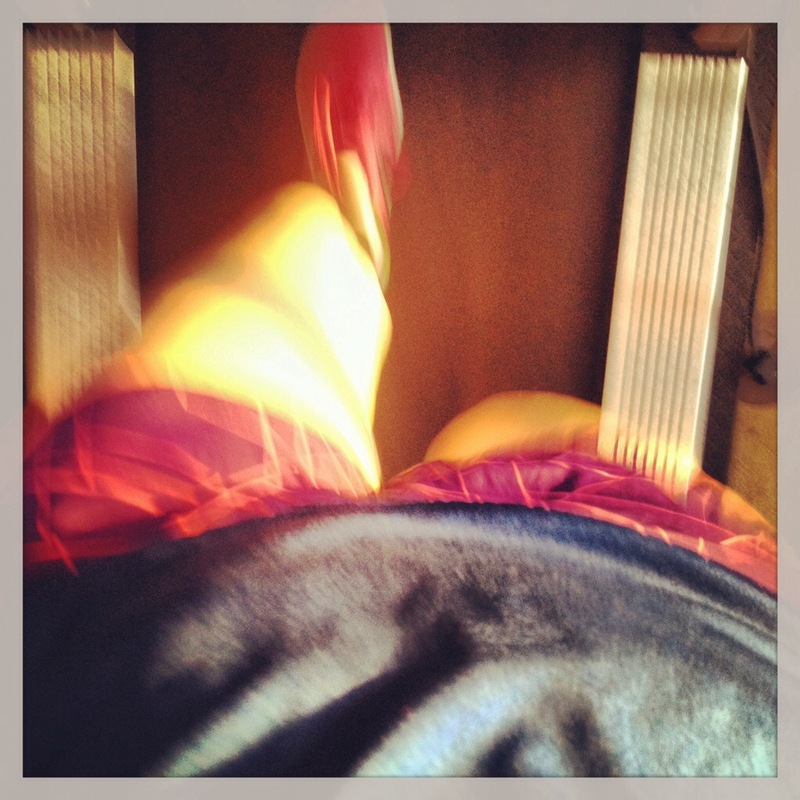 I stopped and rested when I felt my chest tightening (have you ever cried and run at the same time? That’s what that felt like….very strange and alarming). I hopped off at mile 8 to turn on “The Little Mermaid” on ABC Family, and just kept running. When I got to mile 12, I decided to walk for 2 miles while the movie was still on. When my legs felt ready to go, I jumped off the treadmill and got on the bike where I biked for 20 minutes watching the rest of the movie. 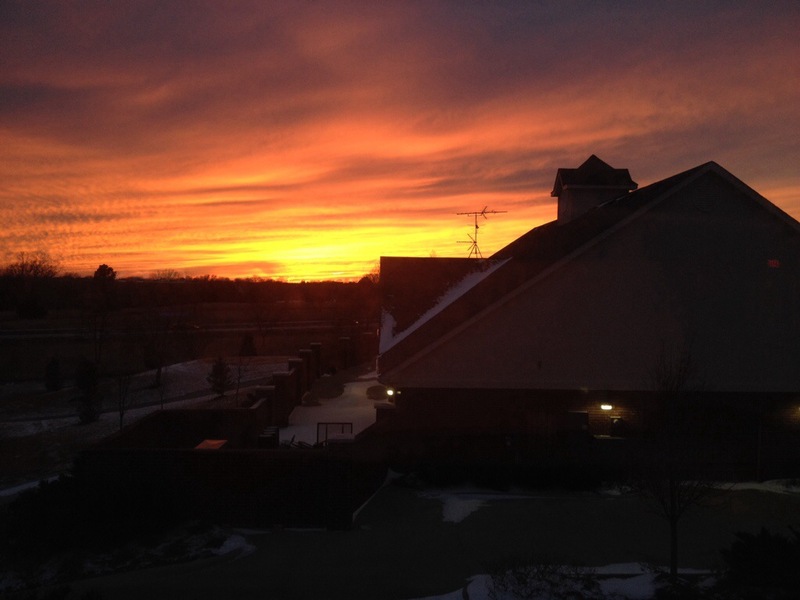 I closed the gym down again and, even though I hated being on the treadmill when I’d have rather been running outside, I got to see this beautiful sunset from where I was running. For the first time in awhile, I actually felt slightly at peace with where I was at the moment. Enough to just be grateful, even if I am not where I want to be. Pretty sure if I had been out on the trail, I might have missed the splendor. Reminds me to be grateful for where I am, even if I hate it. After my run on Sunday, I went home and watched “The Spirit of the Marathon” in front of a delicious recovery dinner. If you haven’t seen this documentary, you MUST. Not only did it make me extremely excited for my next race day, overwhelmingly grateful that I have the gift of running to get me through my hard times, give me the realization that I run because even in the most turbulent times of my life deciding to go for a run is the one thing I have control over, and beyond proud of myself for training for all five marathons completely on my own, but it made me feel like a runner. That medals and PRs are earned without the benefits of crowds lining the sidewalks and cheering for you, that the lonely long weekend runs are where your mental endurance and character are tested, that I am part of a community of true acceptance, and that every small step leads to something great. My life has truly been changed running marathons and I can’t imagine my life without this sport. Over all, week four was one for the books. I faced down the elements when I had the chance, I staved off a possible injury, and I attacked 19 miles on the treadmill in two days. Next week, I face my biggest challenge with marathon training— traveling. But taking things one day at a time, I know I can rise above.